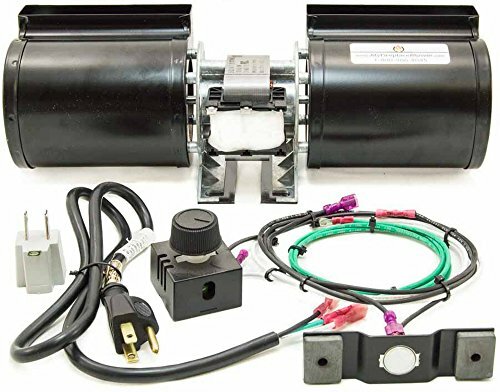 Blower Dimensions in Inches: W: 12.8 H: 4.4 D: 4.87 The Fan Kit comes with Variable Speed Control, Thermodisc (Heat Sensor), Cord Set with 3-prong Power Cord, Magnetically Mounting Base, Hardware, 3-Prong to 2-Prong Adapter, Installation Instructions and 1 Year Comprehensive Warranty. This blower kit is intended to be installed in the lower vent space under firebox. Provides a low cost solution to save energy and circulate the hot air created by your fireplace into your living space. Blower housing is Manufactured & Assembled in the USA. Industry Research & Design contributed to the manufacturing of this high quality aftermarket fireplace blower to meet the original equipment specifications. The blower kit is compatible with various fireplace models, also refer to your fireplace owner's manual for supplemental information or contact us. If you have any questions about this product by MyFireplaceBlower, contact us by completing and submitting the form below. If you are looking for a specif part number, please include it with your message.